The William Floyd School District recently held its third annual STEM (Science, Technology, Engineering and Mathematics) Symposium for community members and students in grades K-12. Mastic Beach, NY, June 10, 2015 – The William Floyd School District recently held its third annual STEM (Science, Technology, Engineering and Mathematics) Symposium for community members and students in grades K-12. Attended by more than 300 people, the Symposium served as a way to showcase student science projects and poster presentations, engage attendees in fun and interactive demonstrations and provide information on the types of STEM and STEM-related courses offered at each level. Attendees were also treated to a Whiz Bang Science Show for the grand finale. Earlier in the school year, William Floyd held STEM Awareness Week in which teachers were encouraged to promote STEM by integrating language, performing and visual arts, science and mathematics lessons in the classroom. During STEM Awareness week, students were encouraged to research STEM careers and identify literature related to famous mathematicians and scientists. They also participated in age-appropriate activities such as designing projects with LEGOS, participating in bridge-building and egg drop contests, creating tessellations in art work, observing patterns in nature, singing songs related to science, technology, engineering and mathematics and more. 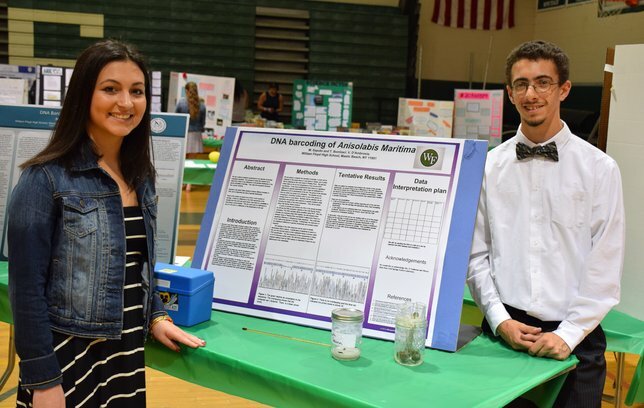 Pictured: Taylor Bombaci (left) and Massimo Saputo at STEM Night with their poster presentation on the "DNA barcoding of Anisolabis Maritima" (maritime earwigs). Subject: LongIsland.com - Your Name sent you Article details of "William Floyd School District Hosts Third Annual STEM Symposium"